This is a new monthly offering for the Basin! Each month there will be a "basket" themed design just like this for you to enjoy! Size: 16 X 36 Inches. Kit includes vintage look ticking, pattern & wool. This is a new monthly offering for the Basin! Each month there will be a "basket" themed design just like this for you to enjoy! Size: 16 X 36 Inches. This is a new monthly offering for the Basin! Each month there will be a "basket" themed design just like this for you to enjoy! Size: 16 X 45 Inches. This gorgeous design will look great in your home all year long! 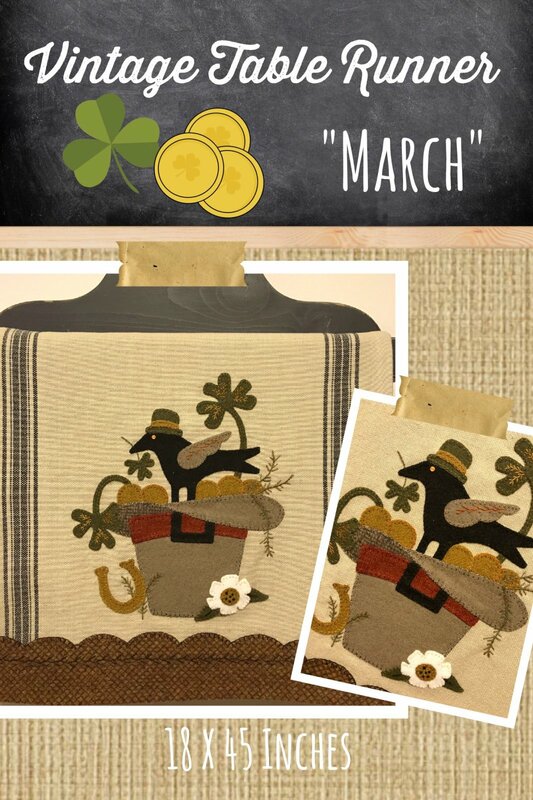 Enjoy March's Vintage Table Runner with this dapper crow sporting his top hat! Size: 16 X 45 Inches. Kit includes vintage look ticking, pattern & wool. 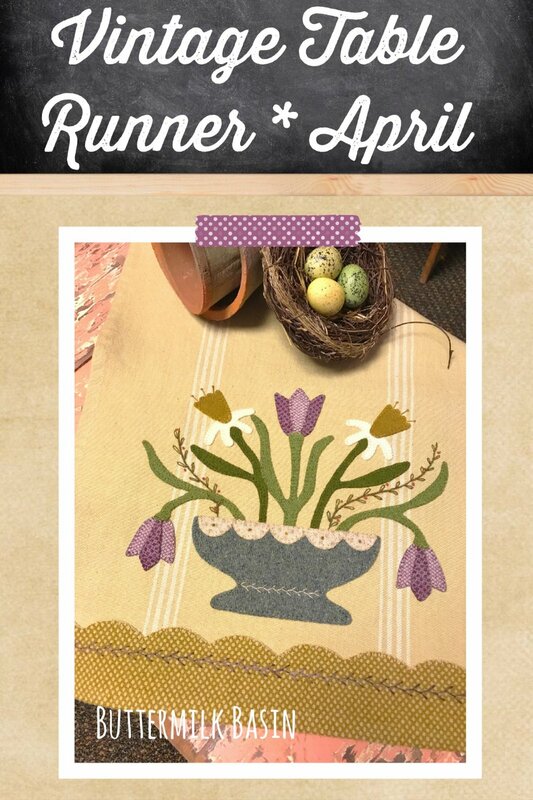 Here is March's Vintage Table Runner! Celebrate St. Patrick's Day with the dapper crow in his top hat! Size: 16 X 45 Inches. 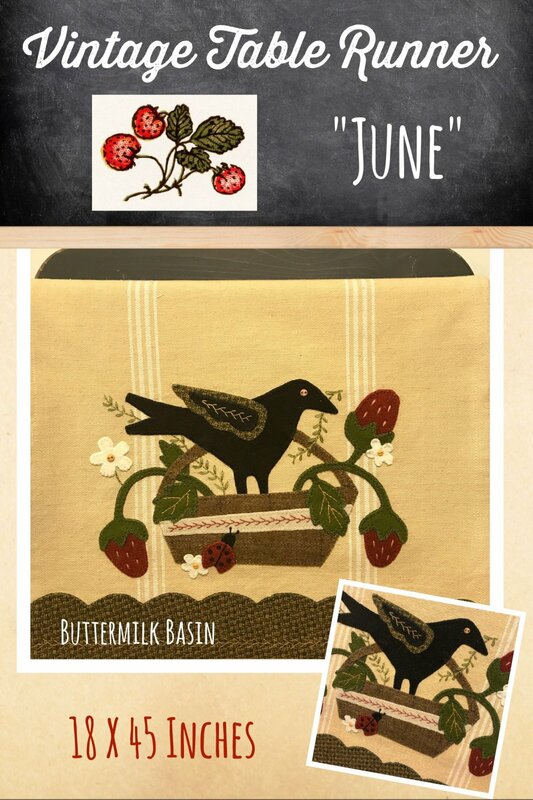 Celebrate the fruits of summer with the June Vintage Table Runner Thru the Year! Size: 16 X 36 Inches. Kit includes vintage look ticking, pattern & wool to complete both ends of the runner, perfect for a long table! Celebrate the fruits of summer with the June Vintage Table Runner Thru the Year! Size: 16 X 36 Inches. This is for the pattern only. 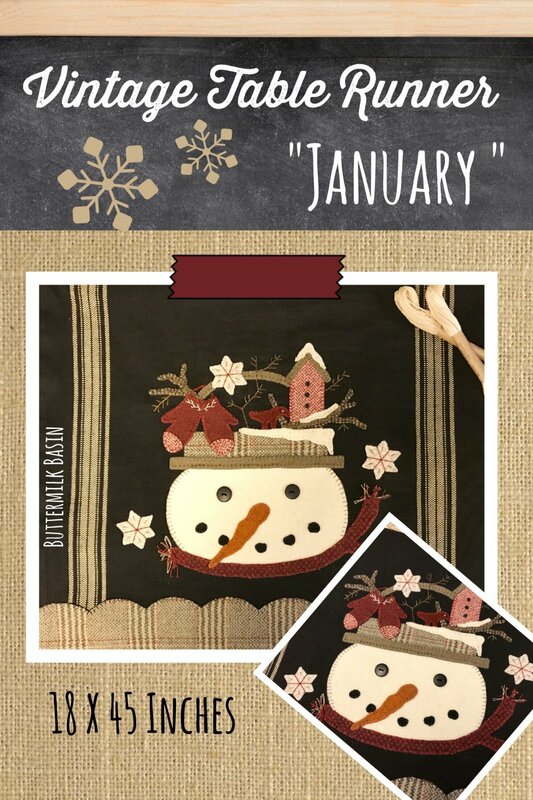 Celebrate summer with the July Vintage Table Runner Thru the Year! Size: 16 X 36 Inches. Kit includes vintage look ticking, pattern & wool. 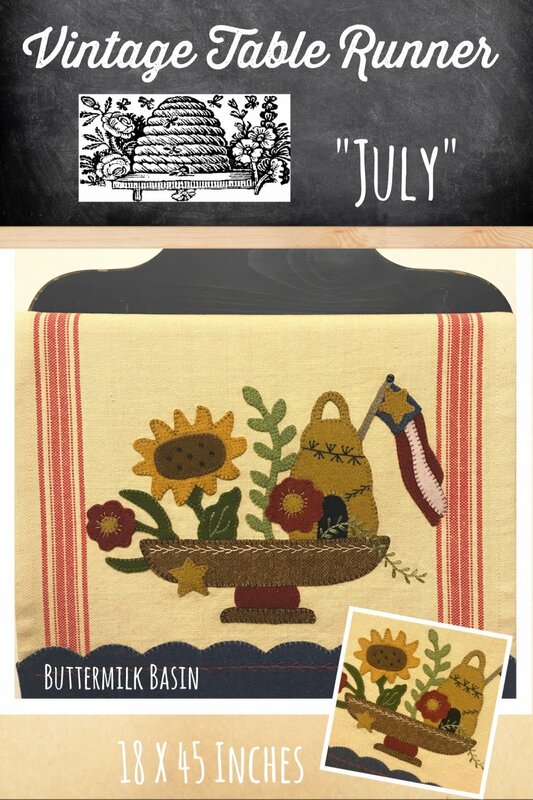 Celebrate summer with the July Vintage Table Runner Thru the Year! Size: 16 X 36 Inches. This is for the pattern only. This is a new monthly offering for the Basin! Each month there will be a "basket" themed design just like this for you to enjoy! 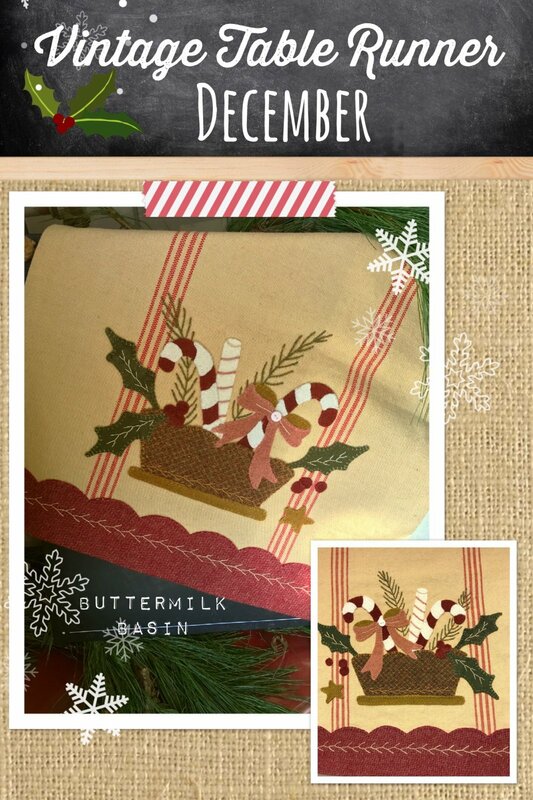 Size: 16 X 36 Inches Kit includes vintage look ticking, pattern & wool.